It’s that time of year when Fayetteville gets busy again with all of the students returning for school. Thankfully, with the return of the students also comes a wave of Razorback pride! Football season has begun and Razorbacks are being seen all over the place – on shirts, pants, hats, and even painted on faces. The staff at Underwood’s is made up of Razorback fans too. Being located right next to the University of Arkansas means that we are in the heart of Razorback country. We have been on Dickson Street since 1957 and have been cheering “Woo Pig Sooie” and calling the hogs for just as long. 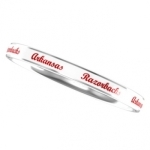 Because of this, we wanted to give our customers another great way to show their pride with our line of Razorback Jewelry. The line features custom made pieces, earrings, pendants, bangles, and charm bracelets. 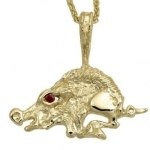 We can’t think of a better way to show your school spirit than with a beautiful gold or silver Razorback. It’s perfect for game day, pep rallies, alumni events, and even holiday gifts. Our wide variety of styles means that there’s something for every fan in range of different prices. 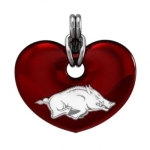 Whether is football, basketball, or baseball season you’ll be able to call those hogs in style all year round. You won’t find high quality, one of a kind jewelry like this anywhere else. Make sure to shop the collection online or visit us in the store. Shop Underwood’s and Woo Pig Sooie!